Car Wrecker NZ supplies Quality and Cheap Used Car Batteries. When it comes to batteries, nobody has you covered like Car Wrecker NZ. If you do require a new one, we'll help you find the right battery for your vehicle and driving habits. We sell battery from $45(Incl. GST) + exchange. Second hand car battery we sell comes with one month warranty. We always test all our batteries before we give it you. 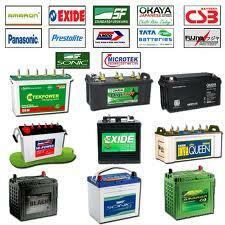 We have batteries available of all size and cars. We have batteries to suit all sorts of vehicles including Cars, Van, 4WD or Trucks. If your battery goes flat, or is even showing signs of giving-up, we are here to help you get back on the road safely and swiftly. Need Batteries for your car? Buy it from our car wrecking yard. Why spend money on new ones when our second-hand batteries are just as good as new batteries. Our battery prices are the cheapest and lowest in Hamilton. We will find a right battery for your car. Not only will you have battery that is as good as a new but you will have it at a quarter of the price of a new one. For the quickest response, please use our online quotation form and do not hesitate to contact our experts for further queries.